In the second of our Keyword Basics series, we'll then show you how easy it is to use the Wordtracker Keywords tool to organize and save those keywords so you can easily manage your site's search engine optimization and pay per click advertising. Start simple. Your starting point does not need to be clever or creative. All you need is a common word or short phrase relevant to your business - Wordtracker will help you find cleverer keywords later. 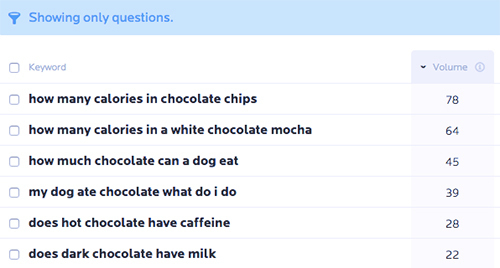 Using Wordtracker's Keywords tool, you can find thousands of keywords that all contain the word chocolate. It couldn’t be easier to start your keyword research - just click the ‘Quick research’ tab and get going! 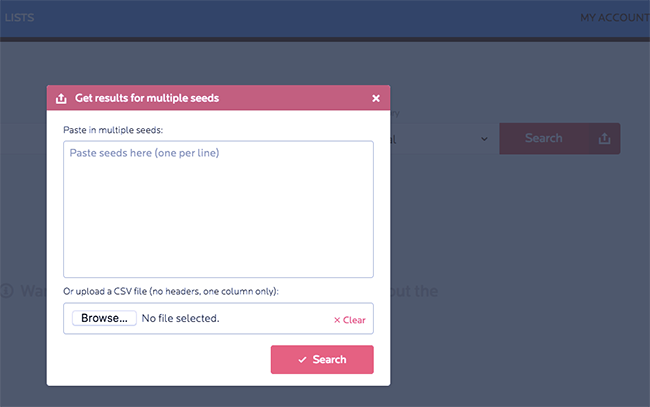 You can just enter a single seed keyword (as we said, if you’re researching chocolate, use chocolate). In a few seconds you’ll see up to 10,000 keywords (depending on your subscription level) containing the word ‘chocolate’ appear in your list, sorted in order of popularity, or Search Volume. There are several things you can do with this list, but let’s start by talking about the numbers you’ll see. This is the number of times each keyword has been searched in the Wordtracker database (Wordtracker’s data comes from a major search engine advertising network which passes us, on average, 3.5 billion worldwide searches per month. They deliver traffic from hundreds of niche web properties, search engines and portals. The data is from the last calendar month. These are real searches made by real people). If you’re new to keyword research, look for relatively high volumes. A high number (against other keywords in the same list) means that lots of people are searching using that keyword. These figures are not meant to be used as an exact number of searches, or a prediction. It’s best to think of this figure (and all the other numbers you see in the tools) as a relative value. Don't worry too much about the numbers themselves. Instead, consider the relationship between the keywords: it’s easier and more helpful to see that chocolate is searched more times than chocolate cake ideas than it is to try to work out exactly how many people will search for each term in the next day or week. IAAT stands for 'In Anchor And Title'. This figure tells us how many pages have been directly optimized for each keyword by having the keyword both in the title tag and also in anchor text in a link from an external domain (somebody else's website). It's a good measure of how much direct competition exists for a keyword, and can help inform your choices. The Competition figure above is based on IAAT. The competition number gives us an idea of how many web pages already exist that have been optimized for each keyword. A high number is bad, as it means lots of websites will be competing with you. The competition figures are on a scale from 0-100. A figure of 100 means lots of competition, so it will be difficult to rank on the first page of Google’s results for that keyword. If you’re new to keyword research, just remember: high competition figures are bad. It's a scaled metric, so you'll never see a KEI of more than 100. That doesn't mean that we can go back to the old method of thinking that a KEI of X or Y is good, or that a KEI of Z is bad - it's still important to look at the numbers as relative values inside a niche - what might be a good KEI for one niche may prove not to be so useful inside another niche - so do look at the relationships between the figures in this column rather than just relying on pure numbers. So how do we use KEI? Simple! There are two ways that we can find helpful figures - we're looking for a high KEI as these are the keywords that show potential. The first thing to do is to sort the column by KEI just by clicking the column header. We can see the highest ones at the top of the list instantly, so look for the keywords that are relevant to your business. The second way you can narrow down your list according to KEI (if you're familiar with the market you're targeting and have a rough idea around search behaviour in that niche) is to use the filters on the right to exclude keywords with a KEI below a certain figure - you'll probably get more of a feel of what to exclude the more you work with a niche. How do we find keywords with potential? You can include or exclude keywords that contain certain words (so if you’re looking at a list for chocolate, you can show (or hide) all the keywords that also contain truffles. It’s easy to filter out keywords with high competition (high competition is bad) or low search volume (bad again, a low search volume means the keyword gets little search traffic). If you’re new to keyword research, use the filters to look for keywords that are popular (high search volume) and have little competition (low competition figure). You can filter by KEI as well as IAAT, or just by keywords containing (or not containing) certain words. Struggling for content ideas? Then you’re not alone. Lots of people find it difficult to know what to write about. The Wordtracker Keywords tool can give you great ideas for creating content. Your site visitors are likely to have a ton of questions about all sorts of things. They want answers and many of them will go to a search engine to find them. When they do so, they often enter their entire question in the search box and hope to find a quick answer. By providing the answers to their questions, you’ll create interesting copy and pick up a lot of relevant traffic for your website. ...and the Keywords tool will generate content ideas by showing you the questions people are asking in your industry. Now go through the results and pick out the questions that are important to your business and use them to create content. Once you’ve got your list of relevant questions, you can either create a blog post for each question or group the questions and answer several in one piece of content. In doing so, use the question as the main title in your content and decide on a secondary keyword that you might also use. So if, you decide to write an article on ‘caffeine in chocolate’, you might decide that your secondary keyword is ‘does hot chocolate have caffeine’ - so you would make sure that your article also mentioned ‘does hot chocolate have caffeine’. With the keyword questions tool, you don’t have to worry too much about what the numbers mean. All you really need to know is that people are asking those questions online – and then provide the answer for them, but don’t just stop at ‘chocolate’ - try using the Keyword Questions filter on your other lists, and you’ll soon have a host of great content ideas. It’s not easy to identify the best keywords for your site when you’re choosing from lists of thousands. You’ll see your original seed keyword in the box on the left. Just click ‘Search’ and you can see all of Google's suggestions and search figures. Don't expect to see the same results as you saw in the Wordtracker numbers. Each list is likely to report its own distinct keywords, and there are likely to be great suggestions in each. Any filters you set up are also remembered. This is a simple task - just hit the 'Export' button, and you'll be able to download a csv file of all the keywords on the page (or just some that you've selected) so you can share or manipulate the data as you please. Build a keyword niche using either Wordtracker or Google data. Export your data so you can share it with colleagues or clients. If you're new to keyword research, it's worth taking some time to familiarize yourself with the tool before moving on. You can see the main features in our Quick Start Guide. If you've questions, please let us know at the bottom of this page. If you’ve got to grips with the tool, we'll move on to the next stage of working with keywords. We’re going to look at how to use the Keywords tool to manage our keywords in an organized way. Google loves clear, logical site structure and the Keywords tool can help you create one. You should start by setting up a list for the website you're working on. 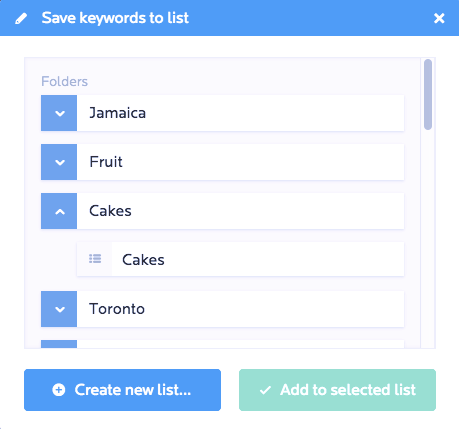 Once you've clicked 'Save' you'll see a window open, and you're ready to save all of the keywords in any of the lists you already have, or you can create a new one. Just click on the folder to expand and see the lists contained. Your folder can hold all the work you do for a single website, with your work broken down into lists. Starting a list is really straightforward - you can do it with a single keyword (you’ll be amazed how quickly this can grow). You know more about your business than anyone else, so it’s likely you can think of relevant keywords that you’d like to investigate. You can easily paste in your own keywords (up to 500) to the tool. Click on the upload icon on the right-hand end of the search bar and you can either paste in your terms (one per line) or upload a csv file. We'll give you data for every one of those keywords that's in our database. Head to the 'Lists' link at the top of the page in the tool and you go to an all lists page where you can see your folders and unsorted lists. Just drag and drop the unsorted lists into an existing folder, or create a new folder via the link at the top. Head to the list or folder you want to work with, and your terms will appear on the page. There are no limits to the number of lists you can save in a folder. Google loves well organized websites, and so will your users. If your site architecture and internal linking make sense, it will be easier for search engines to find and index your pages and, more importantly, for your visitors to navigate through your site. As we mentioned, the Keyword research tool helps you create a clear site structure with the minimum of effort. Let's say you've a category page on your site that's dedicated to selling dark chocolate. You'd like to add more pages and are looking for relevant long tail keywords you can target. When you find a keyword you want to work with (dark chocolate), you can create new folders really easily and keep building up your work. Successful sites will attract traffic from many thousands - often millions - of keywords. So, it's a good idea to broaden your research and look for keywords you might not immediately think of. Let's say our business is carpentry and we'd like to find out what kind of alternative materials people search on. Our task is not to find keywords that contain the word wood. In fact, it's just the opposite - we want to find relevant keywords that don’t contain the word wood. The reason for this is to extend your thinking about how you optimize your pages, and the content you create. After all, if you're only targeting wood you're missing the opportunities presented by bamboo, hardwood and so on. The related feature can help you find hundreds of keywords that you’ve not thought about which could bring more traffic and business to your site. It will help you unearth whole niches you would otherwise miss. These terms will be suggested automatically every time you run a serahc. You’ll find lots of keywords that you might not have considered before - lots of terms that your potential site visitors are using in their searches. Pick the ones that you feel are relevant to your business - either products or services that you provide, or relevant topics that you can produce helpful good quality content around. Then just click on the term to add it to your search. Your input and insight are required: Wordtracker is not a machine that churns out a list of keywords that will automatically bring you traffic and success. If that was so, everybody would get the same results. Rather, Wordtracker is a tool that allows you to find your best keywords. The average person will do their keyword research on a single basic term and stop. And, the average person will do their keyword research once - perhaps when they are building their website - and then forget about it. But that is the way to get average results. Effective keyword research is an ongoing process and to get outstanding results you must work at it regularly. 1. Regularly check your keyword counts using Wordtracker's Keywords tool. Counts can go up and down over time, and keywords can become more (or less) popular. 2. Continue to add keywords to your Projects. The more money-making keywords there are on your site, the more profitable your online business is likely to be. In the next part of Keyword Basics, we'll look at how you can pick the most competitive keywords from your research and how you can use those keywords in your website copy (the text that appears on your web pages).